Are you’re looking for somewhere to store past-dated invoices, in case the tax man pays a visit? Or finally clearing your home of paperwork that has been cluttering up your shelves for years? 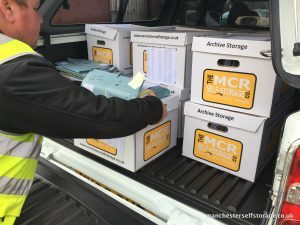 Then the Manchester Self Storage Company can promise you we will keep your documents safe and secure. This is largely due to the quality of our fantastic archive boxes. These sturdy cardboard archive boxes have been designed for one purpose: keeping whatever contents are inside them absolutely safe. Their twin-walled corrugated design are ideal to protect sensitive documents from mechanical damage. Even so, we have managed to keep our prices down to sensible levels with each box currently less than £3. 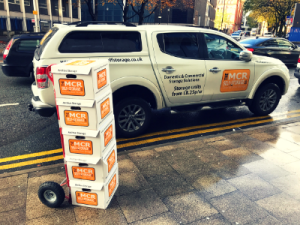 Business owners often find that they can organise their office much more effectively when using the Manchester Self Storage Company to house those documents that are rarely looked at but need to be available for potential audit. With fewer docs in house, it is much simpler to create a system where everybody knows where everything is, creating a more professional yet relaxed atmosphere. Having too many boxes of documents kicking around the office – particularly generic boxes – increases the risk of damage and loss while also potentially creating a health and safety issue. It’s up to you whether you store your self-storage units on or off-site. If you do choose to have them kept in one of our storage facilities you can relax in the knowledge that they will be kept both physically safe (from fire, flood, vermin, handling, etc.) and safe from theft or criminal damage. We have 24 hour, remotely viewable CCTV in place for that purpose alongside monitored alarm systems. Keeping documents safe is one thing, organising them so they can be found again is something totally different. Fortunately, this is also something that the Manchester Self-storage Company can take care of for you. We provide both indexing and databasing services to ensure you can physically and digitally locate your documentation whenever you need it. So no more panicking when your accountant requests a digital copy of that invoice from five years ago that has suddenly been disputed by a customer. Of course, you might also need to access those physical documents in a hurry. For real emergencies, we provide an express delivery service which aims to get the paperwork back in your hands within two hours. For less urgent needs, we operate a next-day delivery service. Both of these services are chargeable but you are always welcome to come to our facility and access your storage units for free. Please give us 24 hours notice and we will make sure your unit is ready in a loading bay where you can simply drive right up to the door.